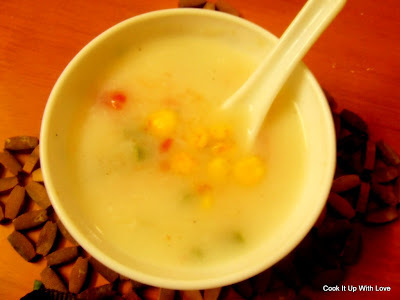 I love the taste of sweet corn kernels in a nice creamy soup. This is my version of the soup, which I often make at home. Sweet corn and veggies with a saucy flavour, this soup has a great flaunt value to impress your guests. The best thing is that it is quite simple to make. Serves 4. 2 cups Sweet Corn kernels. 1 cup chopped vegetables like green peas, beans and carrot. Saute the ginger garlic paste in butter for around 2 minutes. Add the tomato puree, with around 3 cups of water and let it boil for around a minute. Add the sweet corn kernels, the veggies, salt and let it cook for around 8 to 10 minutes. Mix the cornflour in water, and add to the soup. Cook till the soup thickens. Add the grated cheese, sprinkle pepper and serve !